What Happened to the Arborway Line? What Happened to the A Line? Why Are There Still Streetcars in Boston? 43/Egleston-North Station via Pleasant Street Portal streetcar passing under the Main Line Elevated in Egleston Square and about to turn right into the surface Egleston Station, Route 43's southern terminus. Image copyright Frank Pfuhler, 1955. Egleston Square, in its heyday, served as the gateway to Boston for much of Dorchester, Mattapan, Roxbury and Jamaica Plain. While nearby Dudley Station was served by more routes running through the general area, the routes that served Egleston Station better served the residential districts of Dorchester, Mattapan, Roxbury and Jamaica Plain. The 29/Mattapan-Egleston streetcar, for instance, was Mattapan's only direct connection to the El and provided the Elm Hill and Franklin Park districts of Roxbury and Dorchester with a swifter connection to the El at Egleston than other routes that passed through busy Grove Hall to terminate at Dudley. BERy sign at an abandoned entrance, located on LaGrange Street downtown near Washington Street, to Essex (now called Essex) Station in the Washington Street Tunnel downtown, through which the modern Orange Line runs and the El once ran. 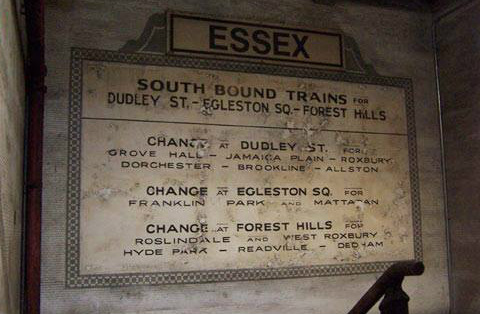 The sign can be dated to between 1909-1912, as when the extension of the El southward past Dudley Square opened in 1909, the only station between Dudley and Forest Hills was Egleston—Green Street Station was added in 1912 to accommodate strong ridership in Jamaica Plain for which the 40/Forest Hills-Egleston streetcar, which ran on Washington Street under the El, could not accommodate. The sign reads "Change at Egleston Square for Franklin Park and Mattapan," clearly referencing the 29/Mattapan-Egleston streetcar. "Franklin Park" would have referred to the Elm Hill neighborhood in Roxbury and the Franklin Park/Field area in North Dorchester. While the sign shows Dorchester could have been accessed by other streetcars from Dudley Square, the 29 was the only streetcar that stopped at an El station that served Mattapan. Image courtesy Dirty Old Boston. 1952 MTA map showing three streetcars and one bus, plus the Main Line Elevated, serving Egleston Station. 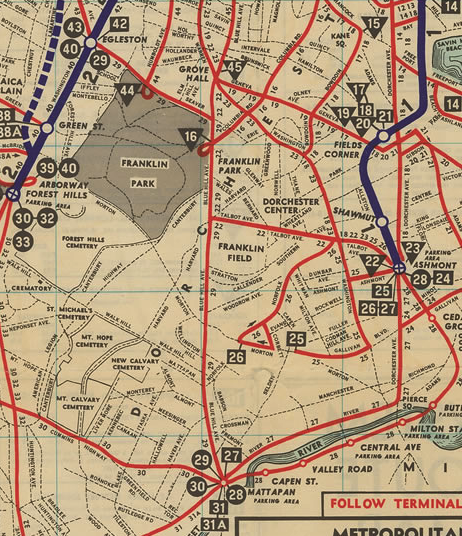 Looking at the map, one can see that the 29 streetcar was the only route connecting Mattapan to the Main Line Elevated. One could take the 22 trackless trolley from the Franklin Field/Park areas to Dudley Station and transfer to the El there, but it made more sense to take the 29, which ran along residential Seaver Street, to Egleston rather than pass through busy Grove Hall. Likewise, for much of Elm Hill, whose southern border is Seaver Street, taking the 29 to Egleston made more sense than the routes that passed through Grove Hall or the 44 trackless trolley, which was much less frequent than the Main Line Elevated or 29 streetcar. Another option for Dorchester commuters west of Blue Hill Avenue was to take a bus to Ashmont Station and transfer to a Cambridge-Dorchester train, but the El provided a more direct ride straight into downtown. Other routes, such as the 40 and 42, ran under the El between Egleston and Forest Hills and Dudley, respectively, making street level stops at which people could board to transfer to and from the El at connecting El stations. 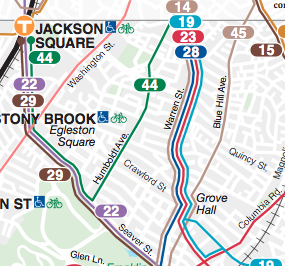 At Egleston, one could transfer to the 29 or to the 43, a streetcar that ran through Roxbury Crossing and the South End via Tremont Street to enter the subway downtown and terminate at North Station. 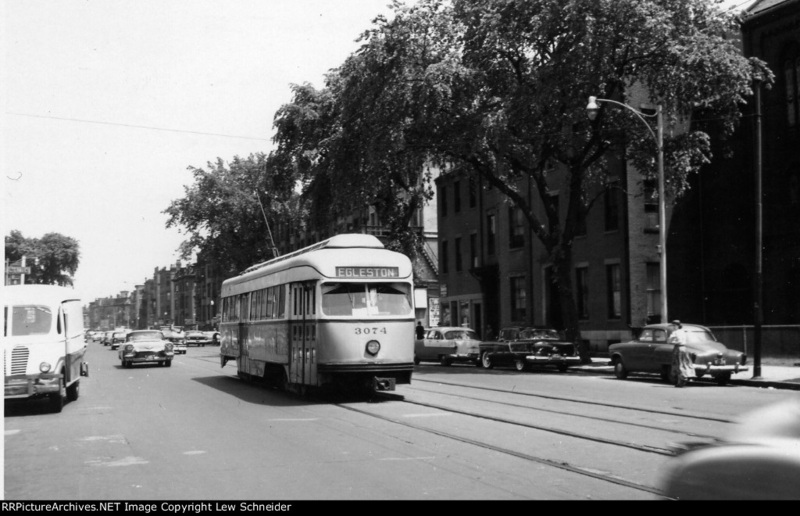 43 streetcar on Tremont Street in the South End headed outbound in 1959. 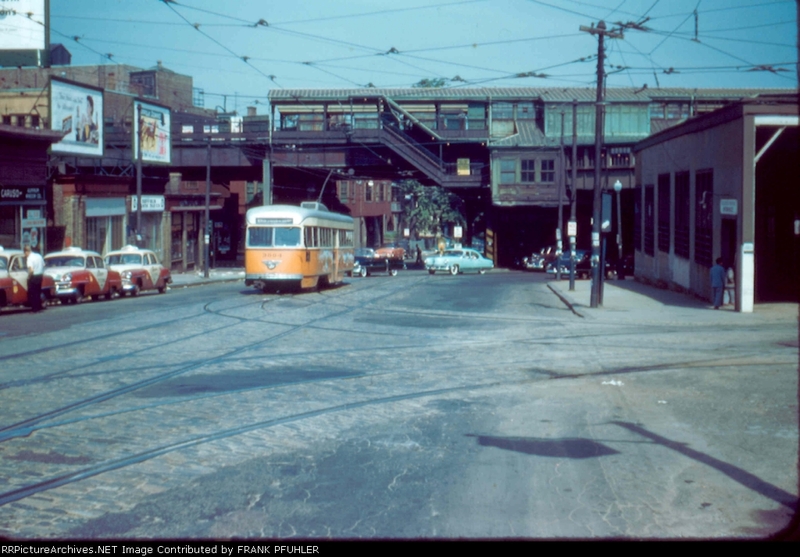 While the PCC pictured is signed "Egleston," at the time of this photograph the sign was an anachronism as route 43 was cut back to Lenox Street Loop in the South End in 1956. Image copyright Lew Schneider. Looking north from the inbound platform at Egleston Station on the El. Note the great views the El offered of downtown Boston and, on the left, Fort Hill. The elevated Egleston Station first opened in 1906, with the extension of the El southward to Forest Hills. Image copyright Joe Testagrose, 1980. 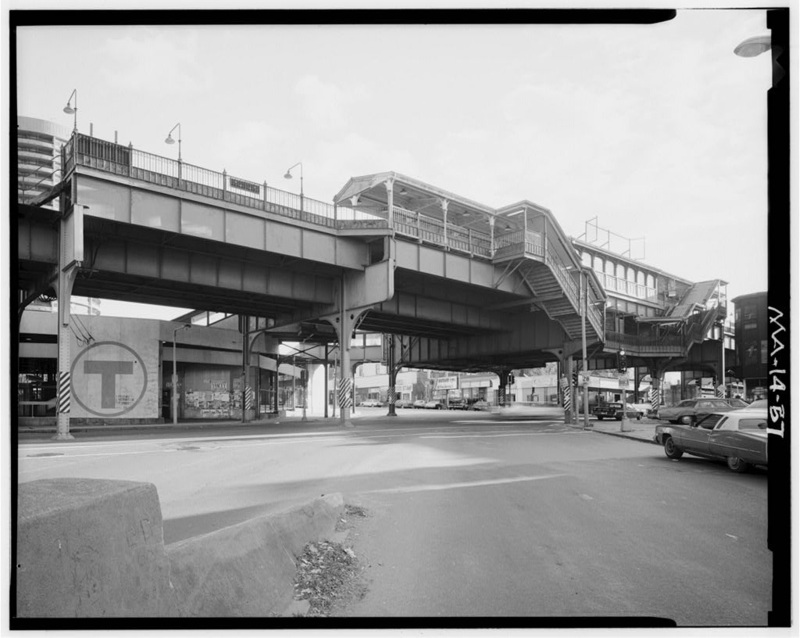 In addition to being a convenient transit transfer point, Egleston Square itself had a lot to offer. Spurred by the extension of horsecar service from Dudley Square to Forest Hills via a carhouse bordered by Washington, School and Egleston Streets in Egleston Square in 1867 (carhouse visible on plate 112 below), Egleston Square became a center of commercial and residential development in Boston. 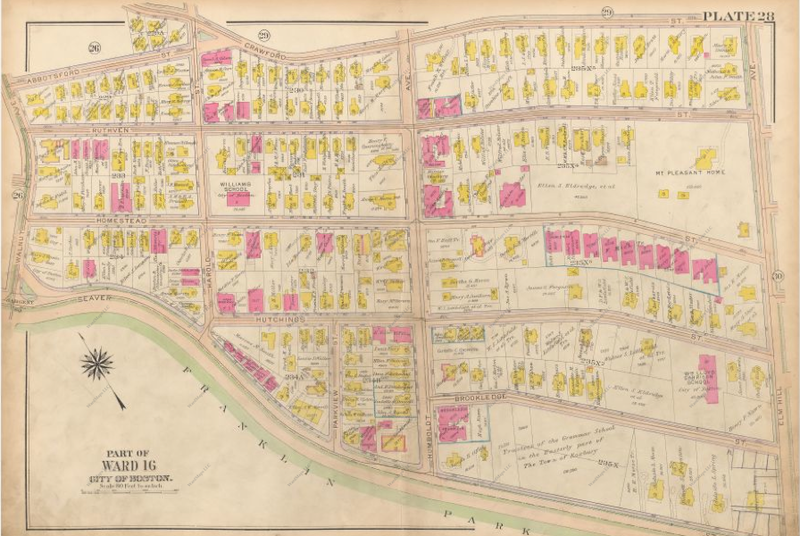 By 1895, as visible in the Sanborn Fire Insurance Company maps below, many homes and storefronts had been built in and around the square, evidently as a result of streetcar service in the area. 1895 Sanborn Fire Insurance Company maps showing commercial and residential development in Egleston Square spurred by existing West End Street Railway lines. Maps courtesy Harvard University Library. In contrast, by 1895, little to no development had taken place along nearby roads that would later come to host streetcar lines. At a time when cars were extremely exclusive, public transit was the easiest, cheapest and most practical way to get around. Likewise, living in a place like Roxbury, which is three to four miles from Park Square downtown, made little sense unless one lived within walking distance of a public transit line. 1895 Sanborn Fire Insurance Company map of a portion of Elm Hill in Roxbury along Seaver Street. Virtually no development has taken place, but within a few years with the routing of the 29/Mattapan-Egleston streetcar along Seaver Street and the 44/Seaver Loop-Dudley streetcar along Humboldt Avenue this area will be developed and become densely populated. 1896 map of street railways in Boston. To the left is Washington Street, and to the right is Blue Hill Avenue. The 29/Mattapan-Egleston and 44/Seaver Loop-Dudley streetcars have not yet entered service, and as a result Elm Hill along Seaver Street is largely undeveloped. Map courtesy Ward Maps. 1915 Bromley map of the portion of Elm Hill along Seaver Street shown in the 1895 Sanborn maps posted previously. Since the 29/Mattapan-Egleston via Seaver and 44/Seaver Loop-Dudley via Humblodt streetcars entered service around 1900, significant real estate development has taken place—now, there are many more houses, many of them multifamily apartment buildings. The houses are built close to one another so as to take advantage of space near the trolleys. 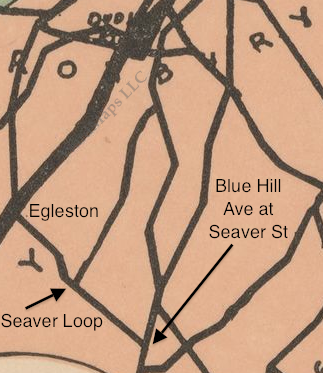 1900 BERy map showing the 29/Mattapan-Egleston streetcar running along Seaver Street and the 44/Seaver Loop-Dudley streetcar running along Humboldt Avenue. Annotations made by Gil Propp, Map courtesy Ward Maps. Follow-Up to Slideshow: To gain a better idea of how expensive a washing machine was in the 1930s, particularly for the generally working-class population of Egleston Square, see the following link. Egleston Square remained virtually unchanged until the 1960s. By 1955, the 29/Mattapan-Egleston streetcar had been bustituted, followed by the bustitution of the 40/Arborway-Egleston streetcar in 1956 and the cutting back of the 43/Egleston-North Station streetcar to the Lenox Street Loop in the South End in 1956. By 1957, after ninety years of hosting street railways, no more streetcars ran in Egleston Square. 1964 BERy map showing five bus lines stopping in Egleston Square. Elm Hill's Route 44/Seaver Loop-Dudley via Humboldt Ave, converted to trackless trolleys from streetcars in 1949, was bustituted in 1961. Map courtesy Ward Maps. Egleston Square's proximity to Roxbury's urban renewal projects, whose execution began in the 1960s, made the square an inevitable casualty of the constant demolition and construction that would take Roxbury by storm. By the mid-1960s, construction had begun on the Southwest Corridor/I-95 and the Inner Belt/I-695, two highways that would have cut right through some of Roxbury's busiest commercial centers (I-95 through Roxbury Crossing and Jackson Square, and I-695 just north of Dudley Square). Hundreds of commercial and residential buildings began to be cleared to make way for the highways, rendering their planned routes urban wastelands (see "Boston's Cancelled Highways" for more information). As a result of the demolition, Roxbury, particularly Fort Hill and Dudley Square, fell into a period of decline marked by significantly increased crime, property abandonment and arson. Due to its proximity to the aforementioned areas and to the construction site of the Southwest Corridor in particular, Egleston Square was a casualty of Roxbury's decline. By the mid-1960s, the Egleston Theater was closed down and people no longer wanted to come to Roxbury what with the events taking place there. By the early 1970s, Egleston Square looked very gritty and was considered quite unsafe. 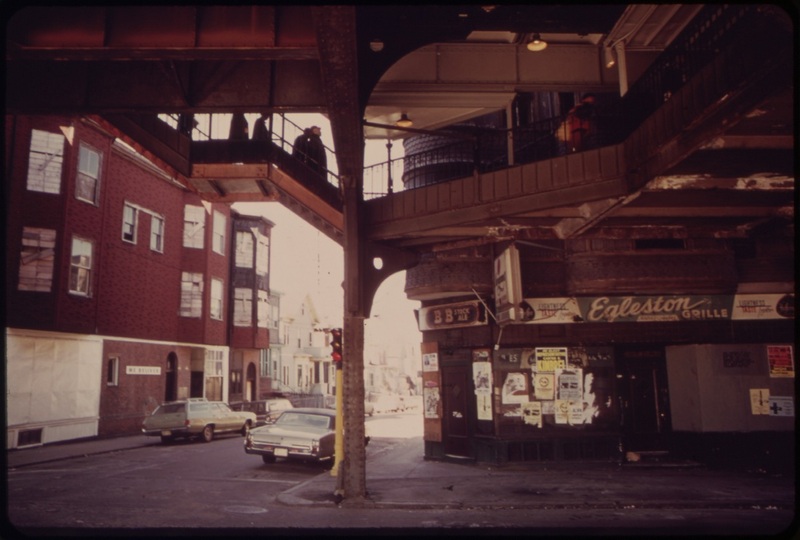 Egleston Square in 1973 on Washington Street right under the southern end of Egleston Station. Some buildings appear to be boarded up, and others look quite seedy. Image courtesy National Archives. Yet in the midst of this decline, Egleston Square gained a noteworthy distinction it retains to this day. In 1968, a perfectly round apartment building for the elderly was constructed in Egleston Square, evidently taking advantage of the square's still-excellent transit access. To this day, the apartment building is the only round building in the entire city of Boston. The round apartment building in Egleston Square today. The building would have been adjacent to the surface Egleston Station, which was located on the lot where the "Egleston Center" development has since been built. 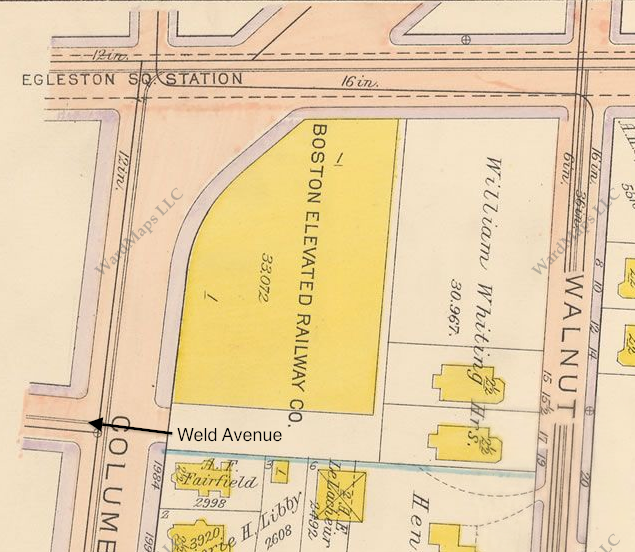 As seen on the 1915 Sanborn map of Egleston Square posted below, the surface station extended east along Columbus Avenue up until Weld Avenue, where the building's lot begins. Map courtesy Ward Maps, annotations made by Gil Propp. Egleston Square remained a gritty, crime-ridden square for much of the remainder of the 20th century. In 1987, with the completion of the redevelopment of the nearby Southwest Corridor, the square lost its greatest driving factor as the Washington Street Elevated was torn down, leaving the square without the transit link it had benefitted from for 78 years. The bus lines that stopped at the surface Egleston Station were rerouted to serve the Jackson Square and Ruggles stations on the new Orange Line, and the surface station was demolished. While the 29 and 42 (combination of 40/Forest Hills-Egleston and 42/Egleston-Dudley streetcars) buses still stopped in Egleston Square (though not the 43 bus, which was rerouted to terminate at Ruggles), Egleston Square had lost virtually all of its transit infrastructure and was no longer considered a significant point in the MBTA network. 1982 MBTA map showing three bus lines and the Washington Street Elevated stopping in Egleston Square. Accordingly, the square is marked as a significant transfer point. Map courtesy Ward Maps. 1988 MBTA map showing the Orange Line rerouted south from Egleston Square and three bus lines stopping in Egleston Square. 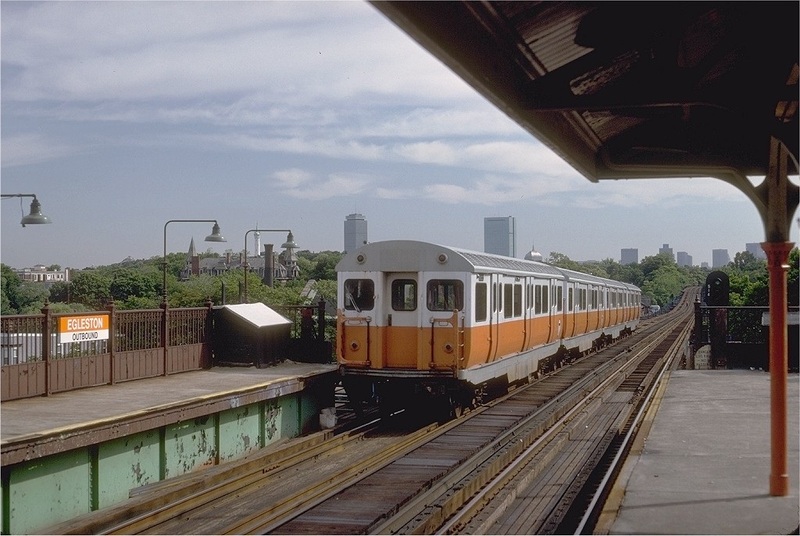 Now, the nearest Orange Line station to Egleston Square is the Jackson Square station, a little over half a mile away, requiring one to walk or take a bus in order to ride the Orange Line from Egleston Square. Even so, while Egleston Square has lost its Orange Line station, Jackson Square is a shadow of its former self, with virtually all of its residential and commercial buildings having been razed to make way for the new Southwest Corridor; at least Egleston retains its original residential and commercial infrastructure. Today, the 42 bus still stops in Egleston Square, and the 29, 22 and 44 buses have been rerouted to terminate at Jackson Square Station, Ruggles Station and Jackson Square Station, respectively, on the new Orange Line, taking them through Egleston Square as well. However, the 43 bus has been cut back to Ruggles Station, which is now a major bus hub in Boston, and as mentioned previously there is no longer a station building in Egleston Square, requiring riders to wait on the side of the street like in a typical intersection in Boston. Accordingly, in the 1988 MBTA map above and 2013 MBTA map below, Egleston Square is marked as a noteworthy, yet not significant, intersection in the MBTA network. Egleston Square in the 1980s prior to the razing of the El, located above the square, and the surface Egleston Station, located on the left of the photograph with the large "T" logo on it. Image courtesy Library of Congress. Egleston Square today, with no El or surface bus station. In the photograph above, copyright Google Maps, we are looking southward at the intersection of Humboldt Avenue and Homestead Street in Elm Hill, Roxbury. Here, not one, but two genuine BERy trolley poles remain directly across the street from one another! The pole on the right is back-guying an electrical pole, and the pole on the left serves as a street sign post. What is most impressive about these poles is that they are still attached to one another via a cable that evidently once supported the electrified streetcar, and later trackless trolley, wires. Virtually all such cables were cut when trolleys ended service in Boston; the reason why this wire remains is most likely that both poles served a purpose as stated above, so there was no harm in leaving the cable connecting them. It is also worth noting that both poles appear to be raked away from the street and are of sufficient height, further strengthening the case that they are genuine. It is also noteworthy that there are triple-deckers and apartment buildings in the view; the poles serve as a testament to these building's transit-oriented past as such apartments were characteristically built around Boston's original trolley lines (see ""Streetcar Suburbs" of Boston" for more information). Another impressive remnant in the area, this time located in Egleston Square proper, is the Egleston Power Substation on Washington Street. 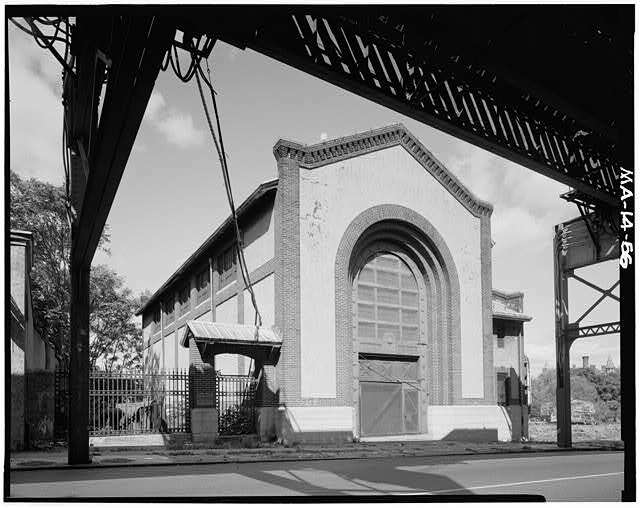 Built in 1909 when the El was extended to Forest Hills, the substation served as the power source for both the El and surrounding streetcar lines. According to a State House press release, the substation holds the distinction of being the first substation in the city of Boston to supply DC power rather than AC.. Considering that the standard power for electric railways today is 600 Volts DC, and higher for heavy rail subway trains, that is an impressive distinction! 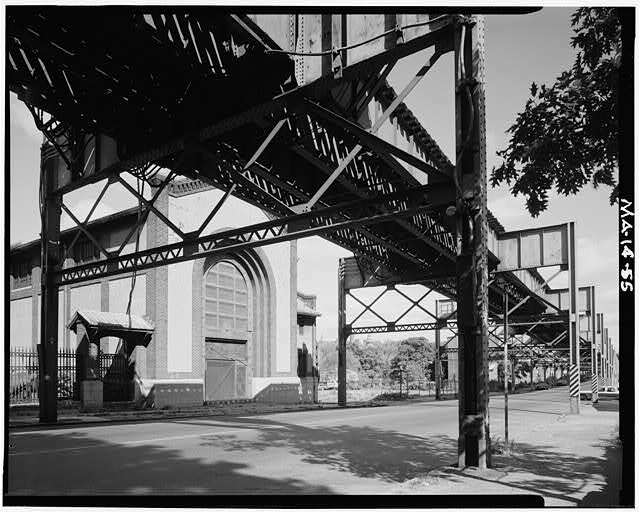 The substation remained in use for 78 years, powering the El until it was torn down in 1987 and no streetcar or trackless trolley lines remained in the area. It remained vacant for twenty years until 2008, when it was impressively restored to become the headquarters of Boston Neighborhood Network Television. The Egleston Power Substation today, impressively restored with great attention to original detail. The Egleston Power Substation in the 1980s. Note the electrical cable connecting the substation to the El. Second view of the substation powering the El. Again note the electrical cables connecting the substation to the El and running along the El as well. Past two images courtesy Library of Congress. In addition to the restoration of the substation, there have been other encouraging recent developments in Egleston Square. In 2007, a brand new office building opened at the corner of Walnut Park and Washington Street. The building currently houses a community learning center and a scientific research center dedicated to the research of cryptozoology. The new office building in Egleston Square. In 2003, the Egleston Theater, which had stood vacant for 42 years, was razed to make way for new affordable apartments and shops which opened in 2004. While the razing of the theater was unfortunate, the construction of the new building, shown below, as well as the office building and renovated substation shown above, are all encouraging signs that Egleston Square is on its way to becoming a safe, attractive and affordable place to live and work. The commercial-residential building built on the site of the Egleston Theater.